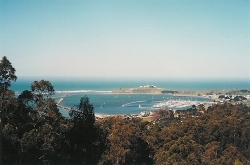 conservation, and recreation on the San Mateo Coast"
Quarry Park is a 40 acre community park in beautiful El Granada. The park features a large family picnic meadow with tables and barbecue pits, next to a play area for toddlers (the "Tot Lot"). The Treehouse, built in 2008, functions as a play structure, conversation area, or stage. Beyond the Meadow, a dirt road leads to the quarry floor and up to a view site overlooking Princeton Harbor. A network of trails winds through Quarry Park and the adjoining Wicklow open space area. Quarry Park is open from sunrise to sunset. There is no charge for parking or for park entrance. Park maintenance activities are performed by volunteers and by the County. Special projects at the Park are supported by private donations and by grants from organizations such as the Half Moon Bay Lions Club. For more information about Quarry Park (including directions and a more detailed description of the park), please click on Quarry Park Info. Friends of Quarry Park periodically holds workdays to maintain and improve Quarry Park. The Community Garden group also holds workdays in the garden area. MPL has held special events, such as Children's Day, annually. All events are held at Quarry Park, which is located at the corner of Santa Maria and Columbus in El Granada (click here for detailed directions). On workdays, volunteers work together to clean and beautify the park with activities such as tree planting, sign making and trail maintenance. Workdays usually occur once a quarter (weather depending) and are advertised on this website and listed in the HMB Review. MPL also hosts their annual meeting and Children's Day in Quarry Park. See our calendar for upcoming events. Quarry Park is available for musical concerts, family picnics and fundraising events. Please let us know about your ideas for other activities. This is your park, so please get involved in one of our events or suggest one of your own. For additional information and to make suggestions, please contact MPL at midcoastparks@sanmateo.org.